Hidden in the woodlands of Cherry Grove is the site of the “Mystery Well 646,” which started a six-month oil boom between May of 1882 and 1883. A dedicated group of volunteers has been working for over a decade to preserve the history of this amazing, though short-lived oil boom in Warren County. Recently the group, Cherry Grove Old Home Days, received a Marion 25 oilfield engine. In its day this engine and others like it, provided power to the pump-jacks in an oil field. Obtaining it is one more step toward preserving the heritage and telling the story of the Mystery Well 646 through an expanding historical exhibit located behind the Cherry Grove Volunteer Fire Department building. The Community Foundation of Warren County and the DeFrees Family Memorial Fund, a component of the Foundation, provided a grant to support the construction of a protective pavilion structure to house the Marion 25 and the exhibit that will be developed around it. 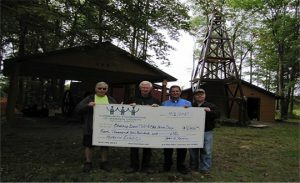 Bob Crowley and John Lasher traveled to Cherry Grove to present the grant check to Walt and Ed Atwood, who have provided leadership and many volunteer hours to the project. For more information about the Mystery Well 646, visit the website, www.mysterywell.com.